Tips for being Green on a Budget! According to Dr. Sears in Happy Baby The Organic Guide to the first 24 Months, the deepest shade of green is the mother who breastfeeds, uses glass bottles, reusable nursing pads, etc. The problem is that all of those are expensive. Here are a few tips that I have found work great to stay green and keep your green in your pocket. As you all know I work full time, and pump at work. When I first started I was concerned as to how to store my milk for long term on a budget. Bottles are expensive and I was not about to freeze a stash like that in bottles. But I was determined to keep as little my milk as possible in plastic. My solution – Mason Jars. I use half pint mason jars. It is really the best solution. The portion sizes are small (8oz) they are reusable, and easily sterilized. Also they are easily marked with dates. I use a Dry Erase marker to easily wipe off the date after the milk has been used. While my entire closet is not decked out with tank tops, a great portion of it is breastfeeding tanks. Why? Because I can easily turn any top into a breastfeeding top when layered with a tank. My abs are covered, but I have access to the goods. The only thing is that the top layer needs to be loose or lifting it will be prove difficult. 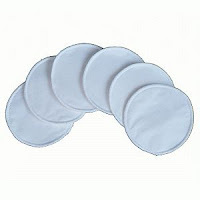 I only purchased a few reusable breastpads, land I used them for less than 12 weeks. I have never used a disposable breastpad EVER. This is really the healthiest thing to do for yourself and your pocketbook. Your body needs to breathe, so let it. If I have a MER or Milk Ejection Reflex at an inopportune time then I just politely cross my arms and apply a little pressure. If any leaks through then it is minimal and drys quickly. I have found this to be an inexpensive miracle cure for most skin ailments. AND CLOTH DIAPER SAFE! I think it cost me $10 for like half a pound or a full pound at Sprouts. The exact size is not important. The stuff goes for miles so it makes it extremely inexpensive. I use it on dry skin, eczema, diaper rash, heat rash, and dry skin. Totally worth it. I buy used whenever possible. This is a no brainer. It is both cheap and the greatest form of recycling. I rarely pay retail for anything largely because of craigslist and eBay. How do you save money and stay green? My name is Tiffany Carra. I currently work away from the house in a 9-5 job and balance cloth diapering, breastfeeding, and chasing my infant son while writing my own review blog www.dudsordeals4moms.com and running our family computer business www.facebook.com/tandsdigital. I also have been active with my local chapter of Birth Network National. A non - profit organization that promotes the Mother Friendly Care Initiative.This was originally posted on my blog http://www.dudsordeals4moms.com/2011/04/green-on-a-budget/ this April, but it got a good response so I thought I would share. The Cloth Diaper Conspiracy, Is there one? Today's Featured Fluff Addict is...Nicole! Knickernappies Twitter Party Winners List! Are you a cloth diaper snob? Crafting a Green World, You Should Check it Out! Do you plan to save or sell your diapers? Knickernappies Twitter Party prizes announced! Cloth Wipes 101: The Basic of using Cloth Wipes!